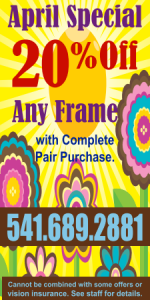 Looking for the best eye doctor near Springfield, Oregon? Look no further than Eyes of The World and our optometrist Dr. Jerry Phillips. We are the eye clinic to come to for eyecare services for you and your family including comprehensive eye exams for adults and children, co-management of laser vision correction surgery, and caring for eye emergencies. We also diagnose and provide treatment for a range of conditions including glaucoma, diabetic retinopathy, dry eye, cataracts and macular degeneration. Our eye doctor, Dr. Jerry Phillips, is one of a kind. Dr. Phillips graduated from the University of Nebraska-Lincoln in 1990, receiving his bachelor of science degree in biology. He received his Doctorate from the Indiana University School of Optometry in Bloomington, IN. in 1998, and holds a diploma from the American Board of Optometry. Dr. Phillips enjoys helping his clients through omprehensive exams, contact lens fittings, diagnosis and management of ocular diseases, surgical co-management, pediatric and geriatric exams. It's important to have regular eye exams, regardless of your age or overall physical health. Springfield eye doctors generally recommend that you have a comprehensive eye exam every one to three years, depending on factors such as your age, risk factors, and physical condition. Our trusted team at Eyes of The World's Springfield location can help you with this. During a complete eye exam we offer to residents of Springfield, Dr. Phillips will go beyond simply determining your eyeglasses prescription. He will also assess your risk for common eye diseases, check how your eyes work together as a team and individually and evaluate your eyes as an indicator of your overall physical health. A comprehensive eye exam at our optometry practice includes several tests aimed at evaluating the health of your eyes and how well you can see. These tests range from having you read an eye chart, to using a high-powered lens to examine the health of the tissues inside of your eyes. Our Springfield optometrist also offers comprehensive pediatric eye exams, so that we can assist you in making sure that your children start off with proper eye care. According to Dr. Phillips, all children should have a comprehensive eye exam at 6 months of age, then again at age 3 and once again just before beginning school. Children that don't have any vision problems or risk factors for eye problems should still generally have their eyes examined at least every two years throughout school, while children with existing vision problems or risk factors should have their eyes examined annually or according to your eye doctor's instructions. Dr. Phillips is able to provide your child with the eye care he/she requires to be successful throughout his/her school experience. Dr. Phillips also recommends a yearly eye exam for all adults who wear glasses or contacts. Even if you don't generally need vision correction, it is very important to have an eye exam every two or three years, based on how much your vision changes from year to year and your overall physical health. This becomes increasingly true if you are over the age of 40. Our eyecare experts near Springfield, OR may recommend more frequent examinations for adults with diabetes, high blood pressure and other disorders, because many diseases can have an impact on vision and eye health, and early detection is crucial to prevent complications. To experience our superior service, and the best eye doctor in town, for yourself, come see Dr. Phillips at Eyes of The World.